The plastics production capacity in the GCC grew 6 per cent to 25.5 million tonnes in 2014 and is projected to further increase 25 per cent to 33.8 million tonnes by 2020, according to a report. 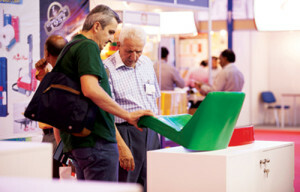 The GCC manufacturers are also awaiting a significant rise in the product portfolio, which is set to go up from the current 13 to nearly 30 in the following years in order to cater to the growing demand from sectors like aviation, transport and food packaging, the Gulf Petrochemicals and Chemicals Association (GPCA) report was quoted as saying. The 3rd Plastivision Arabia 2016, to be held in Sharjah next February, will provide regional manufactures instant access to new machinery, technologies and materials, and insights into improving production and personnel efficiencies and reducing costs. A rising number of manufacturing units is also generating demand for materials and machinery. In 1990, the number of plastics factories in the GCC stood at 326, in 2007 it was 1,223 and by 2012-13, it rose to 7,000. The figure is on the rise with new plastic processing units being set up in the region owing to easy availability of feedstock. Plastivision Arabia 2016 will be held along with Arabia Mold, in association Demat, the organiser of world-renowned EuroMold, the world’s leading fair for mould-making & tooling, design and application development. The 2nd Print Pack Arabia, which is jointly organised by Expo Centre Sharjah and the Indian Printing, Packaging and Allied Machinery Manufacturers’ Association (IPAMA), will also be held concurrently.